Everyone got something different out of the long, odd story that was No Man’s Sky. In the case of Brian McRae, CEO and founder of Fenix Fire, and their early access space survival game Osiris: New Dawn, it was research as to what they should put in. Watching closely what prospective players were interested in seeing out of Sean Murray and the NMS team, McRae used it as information as to the sort of thing he should consider for Osiris. Why not try one of these great survival games? At worst, they’ll kill you. McRae explains that the announcement and trailers for No Man’s Sky gave Fenix Fire confidence regarding their own project, showing that there was interest (and a lot of it) in space survival. “We actually secretly used all of the interviews and questionnaires that were [with] Sean Murray as market research for our game. People were asking: ‘are you going to have alien creatures in here? Are you going to have weapons? Are you going to have multiplayer?’ – basically people were going to him with these giant feature list requests, and he would answer as best he could. “What if we had a robot that you can use as a companion? What if we could tame a creature and make it a pet and ride it? What if you could build a spaceship however which way you want and travel around the galaxy? What if you could build any kind of base you want?” – McRae’s list goes on. It’s an interesting way of finding out what people want. No Man’s Sky’s eventual state aside, it’s going to have inspired a lot of games going forward. 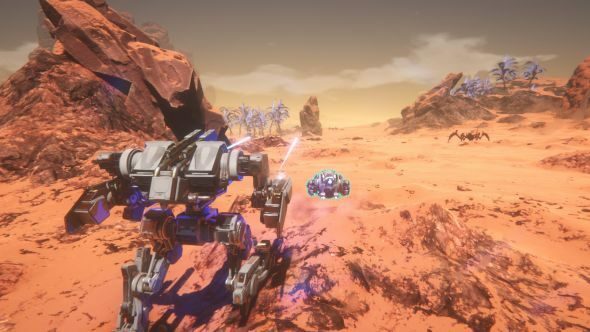 Osiris: New Dawn (on Steam Early Access for £18.99 / €22.99 / $24.99) is probably just the first of many.